At this exciting time in our history, it seems that almost every day marks another pivotal moment in the life of Nazarene Publishing House. We are thankful for the way both the Lord and our customers have walked beside us through recent difficulties. I am glad to report that we have regained our footing and are standing on the mountaintop, where we have a better view of the days that lie ahead. NPH began in 1912 with a mission to share the truth that living a holy life is possible. For more than 105 years, we have provided resources that communicate this life-changing hope. We remain convinced that we have an obligation to take the transformational message of holiness to the world. Recently, I was reading in the book of Acts the story of Saul’s conversion on the road to Damascus. Soon after his conversion, Saul begins using his Roman name of Paul. Adopting a Roman name was typical of Paul’s missionary style. His evangelism strategy was to put people at ease and to approach them with his message in a language and style they could relate to. In an effort to reach beyond the Church of the Nazarene, I also believe it is time to adopt a language and style that can be embraced by those beyond our denomination. At NPH, we are praying fervently and spending a great deal of time to research new methods, develop relevant and practical products, and understand the needs of our customers. We are seeking the Lord’s guidance on how to best achieve our goal of Engaging the Church for the Mission of God. Our primary focus will always be the Church of the Nazarene. Like Paul, we feel some changes are necessary in order to be able to approach those beyond our denominational borders. 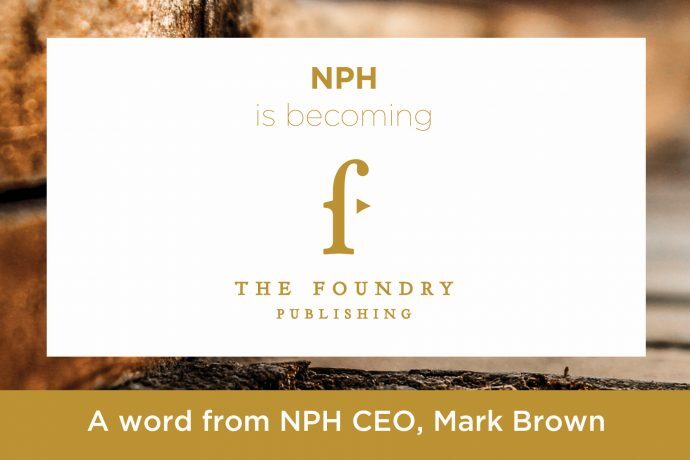 For more than a century, NPH has done this with brands such as Beacon Hill Press, Lillenas Publishing, WordAction, and many more. Now our research tells us that it is time for a new brand, a brand that reflects on our past but opens the door to a language and style that will relate to those we are trying to reach. Please join us in prayer for The Foundry Publishing as we seek new ways to help individuals and churches transform lives. To learn more, visit TheFoundryPublishing.com. I hope this means more resources. I have been living off the Wesleyan Publishing House site because it has resources NPH does not offer. Most recently I had to search for material on spiritual gifts. The place I found stuff through was Amazon selling some UpperRoom’s older reaources. Now, my home church needs material in the Burmese and Swahili languages.